Dutch Cocoa Powder, Natural Flavors, Stevia Leaf Extract, Lecithin, Xanthan Gum. Natural Flavors, Lecithin, Xanthan Gum, Stevia Leaf Extract, . 25g of protein from a pure whey protein isolate to give you one of the highest protein yields per scoop. 0g of sugar to keep you on track to reach your fitness goals. With 5.7g of naturally occurring Branched Chain Amino Acids (BCAAs) to help increase lean muscle. Helps reduce muscle recover time making it ideal for athletes, active individual or anyone involved in intense training. Bodylogix Natural Isolate derives 100% of its protein from whey and only uses the cleanest ingredients available. 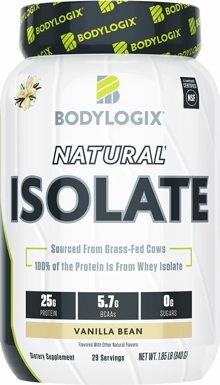 This Isolate also does not have any proprietary blends and with its transparent label you know exactly what you are getting inside the bottle.